“Why, as we get older, do we have more problems with balance? Dr. Daniel Ferris, the Robert W. Adenbaum Professor & Senior Associate Chair, at the J. Crayton Pruitt Family Department of Biomedical Engineering in the UF Herbert Wertheim College of Engineering, and Steven Peterson, a Ph.D. student at the University of Michigan – Ann Arbor, are trying to answer these questions and mitigate this problem. Ferris and Peterson learned that visual perturbation is better at stimulating the posterior parietal area of the brain, where much of coordination is centered. To train the brain to maintain better balance, they worked with virtual reality (VR) headsets, using young adults without any balance problems to establish a benchmark. To typify traditional balance training, Ferris and Peterson used a balance beam built into a treadmill. They tested two groups to determine if visual perturbation via VR could make a significant difference in training the mind to maintain balance. 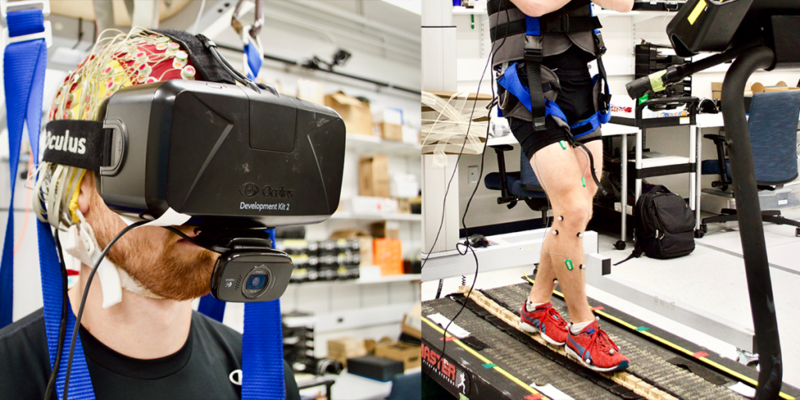 The first of two groups trained by walking on the balance beam while wearing a virtual reality headset (VR) without any perturbation. The second group trained by walking on the balance beam while wearing a virtual reality headset (VR) that caused a visual perturbation (a 20-degree tilt in the field of vision) for one out of every 10 seconds. Both groups also wore a device developed by Dr. Ferris that allowed the researchers to perform mobile brain imaging. 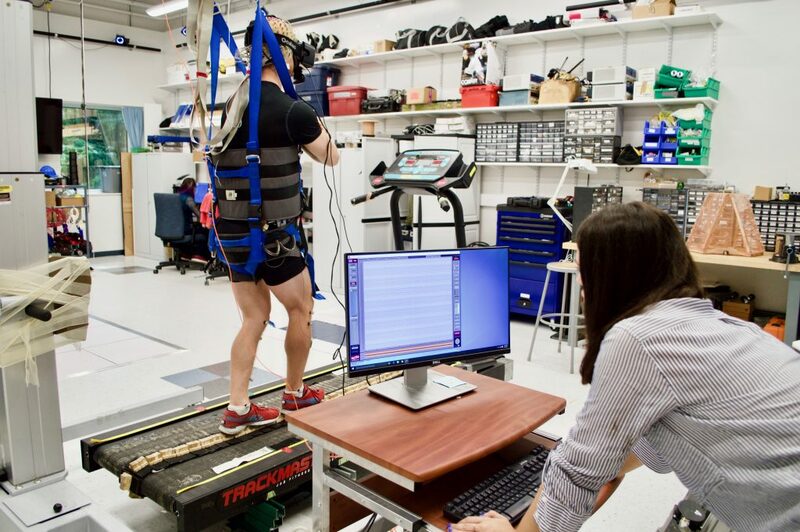 This technology, which allows subjects to move around while the imaging is in process, provided data while the study participants were moving on the treadmill. Post-training testing for balance showed that the balance of the group of people who trained with VR without visual perturbations improved their balance by about 10 percent. The group who trained with VR that included visual perturbations improved their balance by about 40 percent. These results showed conclusively that adding visual perturbations improved the outcome of balance training. VR provided the means to produce the visual perturbations, showing a significant scientific application for a technology that started out to simply entertain people. WHY TRAIN THE POSTERIOR AREA OF THE BRAIN? Initially, Ferris and Peterson compared two forms of perturbation – physical (push and pull) and visual (wearing a virtual reality headset that incorporates visual perturbation). Using mobile brain imaging, they found that the anterior cingulate responds to error monitoring (loss of balance), as experienced in physical perturbation; but visual perturbation does not cause a response in the anterior cingulate. In contrast, the posterior parietal region (where limb coordination is centered) has a strong response to visual perturbation; physical perturbation does not excite much of a response. From this initial study, Ferris and Peterson reached the conclusion that visual perturbation primes the area responsible for coordination that is also important for motor learning. Therefore, visual perturbation should help subjects train their minds to better balance their bodies.